The Spring Education Career Fair Career is focused specifically on the educational departments housed within the College of Education. School Systems should be attending with the intention of recruiting graduating students for entry-level, full-time teaching positions. The Spring 2019 Education Career Fair will be held at 303 . SW Greenville Bv, Greenville, North Carolina 27834, United States. 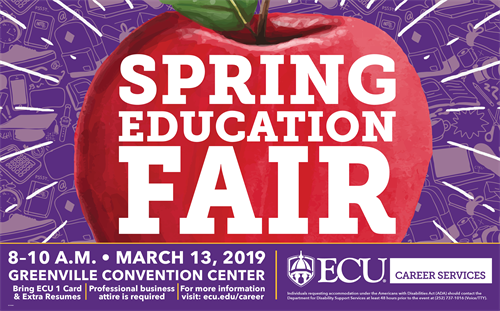 The Spring 2019 Education Career Fair will be held on March 13th, 2019 from 8:00 AM - 10:00 AM. If you have any questions, please contact the Employer Relations Team at (252) 328-6050. Regular registration cost $270.00 and includes one representative's attendance; buffet breakfast, convenient parking, WiFi, 1 8ft table with cloth. An additional representative can be added to the registration for an additional $30.00.